“There’s a way now, the technology is ready, to extremely speed up the design and build of custom machines by integrating three things together,” Vention CEO Etienne Lacroix told MTLinTECH. These two elements work together to eliminate the issue of compatibility of parts that has so frustrated engineers in the past. Web GL renders 3D graphics, and has gotten robust enough to actually 3D design an entire machine in a browser without having to install anything or play with any licenses. 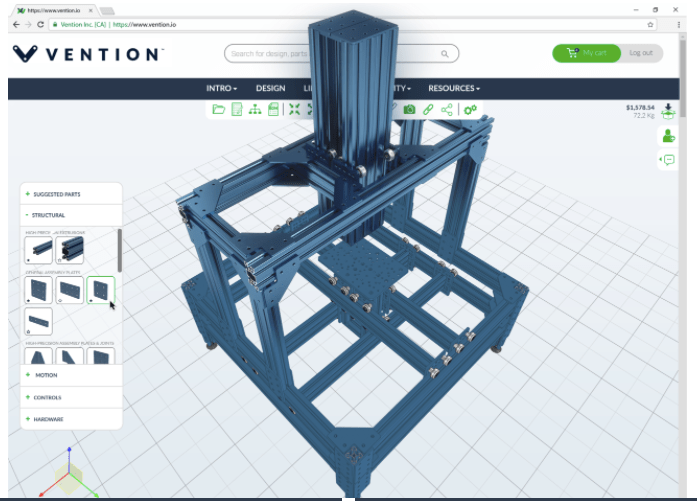 The 3D design platform includes access to a library of industrial-grade lego parts, while the AI integration makes the experience of assembling a machine extremely fast. In fact, navigating the design software is so intuitive that children have been able to do so with ease. The final important Vention integration is community sharing. Designs can be edited by multiple collaborators and can be shared privately or publicly. We always figure if his 7 year old daughter is able to design in Vention, we just made the lives of a lot of people much much easier. The platform is tailored to established and emerging mechanical designers in the fields of small business automation, agile manufacturing, product validation and research, and industrial design. Once designs are finalized, orders are shipped the following day with personalized assembly instructions.